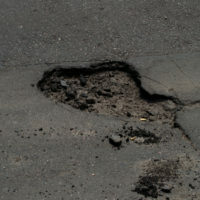 A case recently before the First Department (Manhattan and the Bronx) of the New York Appellate Division asked the court to rule on whether the City of New York was required to consider a claim for injuries caused by a pothole if the City didn’t receive written notice in advance. The Appellate Division ruled in favor of the injured victims, reinstating their claim for personal injury damages. The decision was issued in the case titled Bania v. City of New York. The plaintiffs in Bania v. City of New York were two officers for the New York City Police Department. On the night of their accident, the officers were riding in their patrol car when the car’s tire fell into a hole on Saint Nicholas Avenue between 124th Street and 125th Street. The plaintiffs filed a lawsuit against the City for injuries they suffered after their car hit the pothole. In response, the City filed a summary judgment motion to dismiss the lawsuit, arguing that, since the City hadn’t received written notice of the pothole, the claim should be barred based on the Pothole Law. provided written acknowledgement of the hazard and failed to fix it within 15 days of that acknowledgement. However, if an injury victim can prove that the City “affirmatively created the defect through an act of negligence,” then the victim can still pursue personal injury claims against the city. When the City can prove that it did not have written notice of a hazard, the plaintiff must either prove that the City did have notice, or show that the City created the defect, in order to prevent the claim from being dismissed. In this case, the City’s attempt to dismiss the police officers’ lawsuit was rejected by the Appellate Division based on evidence produced by the officers that the City had created the defect. Specifically, the plaintiffs presented evidence that the City had received complaints about the pothole and attempted to fill it 10 days prior to the officers’ accident. According to expert testimony from an engineer, however, the City’s attempt to fill the pothole failed to involve proper backfilling or excavation and was doomed to “fail almost immediately.” Based on the negligent attempt at filling the hole that occurred shortly before the accident, the Appellate Division concluded that this evidence could convince a jury that the City had created the dangerous condition, and allowed the plaintiffs’ lawsuit to move forward toward trial. If you’ve been injured by a dangerous sinkhole or pothole on a New York City street, get help seeking damages from an attorney who understands the complex nature of claims against the City of New York by contacting the seasoned and effective Manhattan personal injury lawyer Leandros A. Vrionedes at 212-889-9362, or in Queens at 718-777-5895.